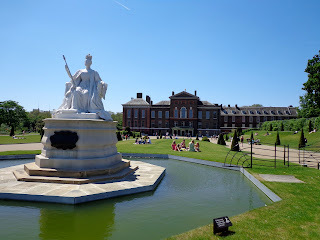 Kensington Palace was built in the late 1600s and was initially the home of the William of Orange and Mary II. Mary II was offered the throne after James II had a son which was to be raised Roman Catholic. There is a rumour that the son was smuggled in a warming pan and so the throne was offered to the Protestant Mary II (James's daughter) and William. Sir Christopher Wren expanded on the Jacobean mansion for the couple. They did not have children and so when they both passed away (Mary II of smallpox and William of a broken collarbone after a horse riding accident), William III and Mary Herietta ruled jointly which was rare. When they both passed away, Queen Anne (James II's other daughter) succeeded them. All of these people contributed to the house you see today. I really like Kensington Palace. The experience is different than any other palace I have ever been to. They have displayed the story of the people who have lived here in a very artistic way. Also the Explainers (yes that is what they are called) were fabulous! They were able to answer most of our questions. I have to admit my Kings & Queens pocket book, has come in quite handy! I put it in my bag to read while waiting in line and now take it every time I visit a property. This is a property not to be missed! Tip: If you plan on visiting Tower of London, Hampton Court, Banqueting House, Kew House and Kensington Palace, it is worth becoming a member! It pays for itself if you visit two places and you can go as often as you want!